Inheriting a team that had gone 2-14 in the previous season, Bill Walsh led the 49ers to win their first Super Bowl in 18 months, and then on to win another 4 Super Bowls in the next 14 years. Amazing, isn't it? Let's take a closer look. Bill Walsh was one of the finest coaches in NFL history. His teaching style, strategy and team-building culture have been studied at top business schools and inspired coaches that succeeded him. Bill differed from coaches of his time known for their aggressive, physical approach to playing the game. In fact, when he began, he was mocked for his more thoughtful and cerebral approach where he focused on details of the game. Bill was unpretentious and soft-spoken. He was creative, analytical and very knowledgeable with a strong self-assurance that was never cocky, but just confident and aware. He had a great eye for talent, from quarterbacks Joe Montana and Steve Young to receiver Jerry Rice and many more - including talent that was overlooked, undervalued or just new and often, under-appreciated. Here we take a closer look at Bill Walsh's remarkable leadership insight and hard-won experience gleaned from his noteworthy book The Score Takes Care of Itself in ten valuable lessons below. Just like the title of his book The Score Takes Care of Itself suggests, Bill Walsh emphasized creating a culture where excellence thrives and is expected. Winning came second. Raising standards and creating an environment of high performance and professional conduct came first. At 49, Bill took over coaching of the San Francisco 49ers after a two-year stint as Stanford's head coach where he brought the team to a win in the Bluebonnet Bowl. Bill's passion and commitment to coaching was evident in his early career but came under national attention when he took charge of the lagging 49ers and led them to consistent wins and a winning mindset that carried on to the coaches that he mentored. Instead of focusing on the score like so many other teams and coaches before him had done, Bill laser focused the concentration of his 49ers team on improving their performance in the field and throughout the organization. Bill did this by hiring the best talent he could, teaching them his Standard of Performance and uniting the whole franchise from the quarterbacks to the secretaries to thinking of themselves as a team with ownership over both performance and results. Bill called this new winning culture, his "Standard of Performance," a different way of thinking and acting - that was based on high standards, strong work ethic and a commitment to being first-class in action, approach and mindset. Bill was interested in cultivating an inventory of skills - both in attitude and in physical behavior - that would lead to better execution. Taking over a losing team was undoubtedly difficult but unlike many others who focused on immediate wins, Bill emphasized improvement throughout the 49ers and directed everyone involved to focus and even obsess over the details and quality of execution as well as their own attitudes and actions. He believed winning would take care of itself. In terms of hiring, Bill aimed to hire what he considered the best personnel with four major characteristics: talent, character, functional intelligence (able to think on your feet) and eagerness to adopt Bill's new approach. He also looked for intelligence, a willingness to work with others in a team and a keen interest to contribute to the 49ers. His goal was to hire the best and teach them what he thought was high performance. Along the way, Bill also had to let go of individuals who did not maintain the same high standards, challenged authority or were unwilling to grow. Bill's ethics and standards were epitomized in his Standard of Performance, a list of guidelines he had put together to structure the organization and to create a culture of high performance. It was in many ways his life's work and his personal standards that he taught as the coach of the 49ers to his team and the entire organization. Through this process, Bill put everyone on the same page in terms of professionalism and expectations. He then explained how to achieve these high standards through detailed lists and explaining what he wanted each individual to accomplish. He laid out the details of perfecting performance, no matter what role the person played in the success of the 49ers. Bill's focus was on continuous improvement and raising standards for everyone in his organization and for the team as a whole, instead of just winning alone. As the new coach of the 49ers, Bill went to work immediately to create a Culture of Success where high standards were the norm and everyone was expected to bring their A game, work hard, plan, prepare, master the details and perform consistently better. He led by example by modeling the behavior he wanted to see in his employees and in his athletes. Bill communicated often, taught and explained every detail thoroughly one-on-one as needed and praised generously. The right culture for his team was fundamental to lasting success. Bill knew this and that he would have to demonstrate his values through his own behavior on a daily basis. He had to be willing also to enforce the expectations and standards for how his new program would work, from the details of how the athletes would train, practice and compete, to how they would behave on and off the field, win, lose and lead. Creating the right team culture is essential. Communicating what this means for your organization, implementing it through standards and expectations, and then sustaining it successfully, drives lasting success and victory. Implementing the culture you desire for your team takes time. There will be those who refuse to accept your new standards and you have to be willing to confront and remove them if needed, despite the level of talent or time invested. Bill's example demonstrated that persistence is key. Building a successful team culture takes time, hard work and a positive mindset. Over time, this culture attracts the talent, resources and support that you will need to succeed. Bill succeeded in setting a high professional standard for the 49ers, a football franchise that went from being considered the worst in the league to Super Bowl Champions. Instead of focusing on the win, Bill and his team focused on mastering all the details that led up to the game and the process, rather than the win itself. This could range from an athlete spending an extra hour lifting weights or a quarterback perfecting technique on the field again and again. The 49ers exemplified this mindset. Bill emphasized individual ownership for everyone involved with the 49ers, regardless of the capacity that they worked in. He put the team first, where they were united and accountable for both winning and losing. Victory and defeat belonged to everyone. Consistent winning for a sports franchise requires a strong, positive team mentality and excellent leadership. Bill knew this and also that the team could not consist of individual rockstars or contractors for their own interest, but had to be a united team with connection and extension. A great example of the kind of deep connection and loyalty that a strong team engenders can be seen at times in organizations like the military where individuals are willing to go the extra mile and sacrifice. Any organization that inspires such loyalty has achieved this sense of connection and extension. Bill wanted his team to also have the camaraderie and loyalty of a united, cohesive team that worked together as one unit. Initially as Bill was getting his team and the entire 49ers organization to work together cohesively and adopt his new Standard of Performance, there were naysayers and individuals who criticized his approach and blamed others for mistakes and losses they faced. Bill would not allow this behavior of blame and scapegoating. He emphasized collective ownership and accountability as well as ethical, fair and constructive behavior in the locker room, on and off the field and behind the scenes. The leader sets the tone of an organization. Bill Walsh knew this and exemplified this in his organization by modeling the behavior he wanted his team and staff to exhibit. Work ethic was paramount to him. He knew that by demonstrating his own devotion to work, that his team and people would see directly what he expected of them. People looked up to him as a role model from commitment to work ethic, decision making, methodology and management. View Wired for Sound highlights from the San Francisco 49ers on YouTube. You might think that with high standards that Bill would have been very tough on his team when they failed to meet expectations. He wasn't. Bill would just come over to the player with the correction of what was wrong and how to do it right. He did not get upset but just kept teaching all the details, no matter how small, of how to perfect performance. Teaching was a top priority for Bill. He taught the San Francisco 49ers to want to be perfect and unleashed a hunger for improvement and becoming better. Bill loved teaching and he showed his eagerness and passion for football in his teaching. His enthusiasm was contagious and motivated his team. Bill praised his team and individuals when they did well. He was always appreciative and supportive. He would remind players of their abilities. Bill taught each individual player the details of high performance so the player could go out and achieve it. He turned his players into great students. Unlike other coaches that pushed their teams very hard on Wednesdays, Bill would ease up on training so that his players could be their best on Sundays. He always thought out plays and practice in advance with logical reasons, while raising standards. He commanded the attention and loyalty of his team naturally. In a 1993 interview with Harvard Business Review where Bill was asked how he worked with individual talent while advancing the team's goal, Bill explained, "It is the job of the coach to find the best of both sides. We had to have a very structured system of football, and we also wanted instinctive and spontaneous play." Bill insisted upon treating people fairly and creating and maintaining a safe, positive and professional environment where people were heard. He emphasized treating people right and often said that an organization was only as strong as its people. He had a conscience and required ethical behavior throughout the organization. Bill had experienced unfairness in his own professional experience prior to joining the 49ers. His insistence on integrity and ethics percolated down to the smallest detail of professionalism that he expected from secretaries and support staff. Bill created and sustained a positive, uplifting atmosphere with his enthusiasm, energy and encouragement. He insisted that everyone was treated with equal dignity and respect and that the individual well being of each person was important. Even when he had to let people go, Bill aimed to be diplomatic, compassionate and honest at the same time. While communicating in a friendly manner and encouraging friendships to develop, Bill prevented favoritism and VIP treatment. Bill knew that his leadership alone would not be sufficient to truly transform the organization and internal dynamics of the team. He needed support from leaders within the team itself who could help create and reinforce the new positive, unifying team culture with higher standards that he was creating. Bill enjoyed this part of his work too, saying that teaching was one of the most satisfying parts of his job. He emphasized fairness and treating people right, working with natural leaders within the 49ers team so that the team stayed united and maintained high standards even in locker rooms. A lot goes on behind the scenes in the locker rooms. There are many leaders within an organization that can aid or hinder what the actual proclaimed leader in charge is aiming to do. Bill enlisted the support of these 'locker-room' leaders to create and drive change in the organization and instill a positive mindset. This approach was widely appreciated by assistant coach Mike White and others who recognized the major role that interior locker-room leaders can have on team culture. In addition to enlisting support of internal 'locker-room' leaders within your team who support your vision, you also have to identify and remove those negative leaders that are destroying your team culture. Bill encouraged team players who held themselves to a higher standard and led by example. Bill loved lists, which he considered road maps to results. He had lists for everything and everyone on his team. He was creative, solution-oriented and brilliant at breaking down problems into relevant parts that he could then solve. Bill would then teach the solution to the necessary individual. This commonsense and brilliant approach enabled him to implement his Standard of Performance with everyone he hired and worked with. Bill planned a lot - for foul and fair weather, for pressures and for handling loss. He planned for contingencies including failure and recovery. He knew that victory was not always under his control and he accounted up to 20 percent of a win to luck but the remaining 80 percent to preparation. He emphasized planning and preparation throughout the organization and specifically with plays for his team. Bill's goal was to maximize the chances of perfect performance under pressure in any and all contingencies. How do you do this? You perfect and own the details so that you can perform consistently in changing environments. He had his players practice and practice again and again till they owned the details and were self-motivated enough to keep improving on their own. Mastery and constant improvement was the goal - not just winning a game. He also emphasized mental toughness and trained his athletes to have poise under pressure. It's easy to lose faith when you have had a string of losses. The 49ers knew this well. When Bill took on the leadership role of head coach, he did not have instantaneous wins. In fact, the 49ers continued to lose but he was busy reinventing the entire culture of the 49ers and putting in place high standards for performance and professionalism. It would have been easy to give up when Bill faced a lot of pressure and ruthless criticism in the press in his first 18 months at the 49ers. Defeat is not easy to swallow, especially in sports where the whole country is watching, but being able to learn and go forward is essential. Defeat and failure is to be expected. The key is to not give up, to get up and fight again. Bill was no stranger to defeat or crushing loss. In fact, he considered failure to be part of success. That did not deter him however. It's easy to get caught up in 'what could have happened' or 'what should have happened.' Bill's advice is to allow yourself appropriate time for grieving but to not look backwards continuously. Instead, begin planning your next serious move and remind yourself that you will stand up and fight again. 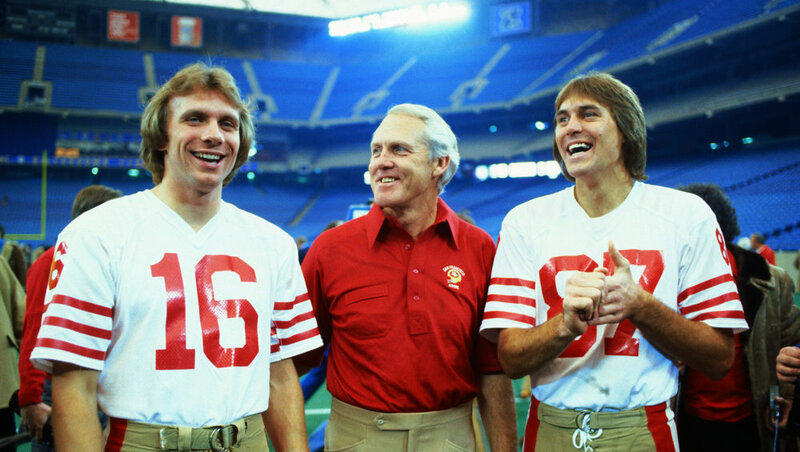 Just 18 months after the San Francisco '49ers lost decisively to the Miami Dolphins in a critical game, Bill Walsh led the team to their first Super Bowl. Bill Walsh was a confident, fierce competitor. He had a vision of where he wanted to go with the team despite inheriting a team with a 2-14 losing record. Within two short seasons, he led the 49ers to winning their first Super Bowl. His indomitable will power was evident in his methodical approach where he studied the situation at hand and came up with strategies to win despite new challenges facing his team. A great example of this was his famous West Coast Offense. Bill designed perfectly timed plays with a strong emphasis on footwork. He had his players practice again and again until the moves became second nature. In many ways, it was similar to a dance performance with choreography. Bill had scripted out complex plays and ideas, but he simplified them into steps his players could remember, practice and perfect. He had thought through the moves so well that he could instruct players on what to do next in the field with their opponents regardless of who they were or what else happened on the field. For example, with quarterback Steve Young, his moves were perfectly timed so that when he completed them on the field, he would be in the position to throw the ball just as Bill had told him he would! Things would open up just at the right time. Bill recognized the importance of strength of will as paramount to high performance and achievement of any kind. He looked for this trait in people he hired as he built his team. Collectively, this fierce indomitable spirit to compete and win gave his team a massive competitive advantage. Bill raised everyone’s standard, what we defined as acceptable. Perfection was his acceptable norm, and he got us thinking we could achieve it by teaching us what perfection was and how to reach it - not just how to locate a receiver, but every other aspect of doing your job at the top level, whatever that job was in the organization. It was something special, teaching a person, a whole team, an entire organization, to want to be perfect, to want to get to the next level, and the next one. And then do it. Bill believed that in order to achieve outstanding performance, you had to master the details. This involved hard work, preparation and ongoing practice. This commitment did not waiver no matter how much natural talent you had or how many hours you had put in previously as a rookie. In The Score Takes Care of Itself, Bill explains the commitment of his receiver Jerry Rice and his quarterback Joe Montana to master their roles. "If you’re Jerry Rice, the greatest receiver in NFL history and, according to some, the greatest player, you’re practicing a slant pass pattern at 6 A.M. over and over with nobody within a mile of you — no football, no quarterback, nobody but Jerry working to improve, to master his profession. Why is the NFL’s greatest-ever receiver doing this? Jerry Rice understands the connection between preparation and performance; between intelligently applied hard work and results; between mediocrity and mastery of your job. And Jerry has the skill coupled with the will to do it. Joe Montana, perhaps the greatest quarterback in NFL history… would spend two hours a day every day at the same little practice field at Menlo College near San Francisco. I would work with him on basic fundamentals that would bore a high schooler to death. Joe Montana understands what mastery means. You never stop learning, perfecting, refining — molding your skills. You never stop depending on the fundamentals — sustaining, maintaining, and improving. Jerry and Joe, maybe the best ever at their positions, at the last stages of their careers were still working very hard on the fundamental things that high school kids won’t do because it’s too damn dull. It wasn’t dull to Jerry and Joe, because they understood the absolute and direct connection between intelligently directed hard work and achieving your potential. We all do; you do; I do. The “big plays” in business — or professional football — don’t just suddenly occur out of thin air. They result from very hard work and painstaking attention over the years to all of the details related to your leadership." In conclusion, Bill Walsh reinvented an entire football franchise and demonstrated how to lead successfully and create a winning mindset and professional team culture that focused on improvement and mastery of details with positive feedback. He taught leadership and team-building essentials that can be expanded beyond an NFL franchise to running a business or organization of any size. We hope you find reading these leadership insights helpful in your own life. For more Profiles, search for Profile in our Elf blogs. Learn with us! When you focus on creating and sustaining a culture of success, winning takes care of itself.